It is a widely accepted notion amongst intellectuals of political science and international relations that foreign policies of countries for the most part remain stable over long periods of time. It is not so without reason. International relations are forged, developed and nurtured over long & hefty periods of time. Countries put great effort into these relations because it somehow or other mutually benefits them to be in a state of cooperation than conflict. Because if otherwise, a misquoted statement from a public official of country A about country B could pave the way for potential disaster, if not for the first line of defense provided by the diplomatic ties established between these countries. Intergovernmental organizations (IGOs), i.e. entities formed by states coming together such as the United Nations (UN), The Association of Southeast Asian Nations (ASEAN) and South Asian Association for Regional Cooperation (SAARC) to name a few, are established for various reasons. Whether for economic or defense needs or to strengthen bilateral or multilateral relations, these entities form a platform for countries to engage in and benefit from each other, in terms of trade deals and other such mutually beneficial ventures. Entities like the UN, even though might not hold absolute authority over countries given the state of anarchy that exists when it comes to a universal government of sorts to oversee affairs of all nations, even with the limitations present, it however does provide nations with a sort of check and balance mechanism within the existing framework of the establishment. This helps member countries to work with especially those nations that are considered to be taking a turn for the hostile or are seen shortchanging their citizens on issues of human rights, democracy and freedom etc., so that its citizens in the least have somewhere to turn to when all avenues of justice and hope they seek are not to be found on their home turf. Similarly for the Maldives, ever since it gained its independence from the British in 1965, it has formed bilateral and multilateral ties with a lot of nations on the diplomatic front. For a country such as ours that is small and seemingly insignificant when considering the larger scale of things, these ties are essential to our very existence. A country, a large part of whose income is derived from high end tourism is in no place to snub the international community over reasons that are as or more abhorrent to say the least. The news yesterday that the incumbent government of Maldives had finally had it with the Commonwealth and decided to leave the body was one that sent shock waves through citizens of the nation. Considering the fact that Maldives has been a member of the Commonwealth since 1982 and going 34 years – not a small number of years in my opinion, this time, Maldives has with pride, joined the ranks of esteemed countries like that of Zimbabwe which in 2003 announced that it was leaving the Commonwealth after being suspended in March 2002 over serious issues in its elections. Formerly known as the British Commonwealth, the Commonwealth of today came into formal existence in 1949 and forms a loose association of former British colonies and current dependencies, along with some nations with no significant historical ties to Britain. It was not until 1947 when India and Pakistan achieved their independence from the British that the Commonwealth as we know it today emerged. Even though the word British was dropped from the name then, the British monarch remains the official head of the Commonwealth. 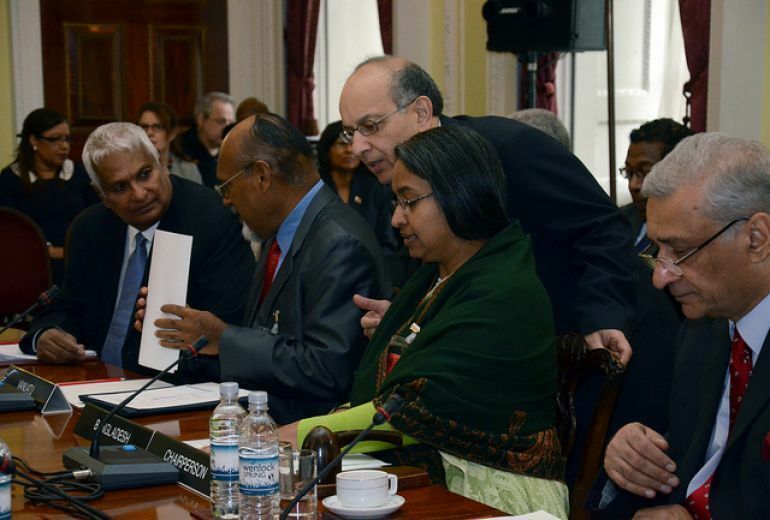 The Commonwealth charter sets an ambitious agenda for member countries. 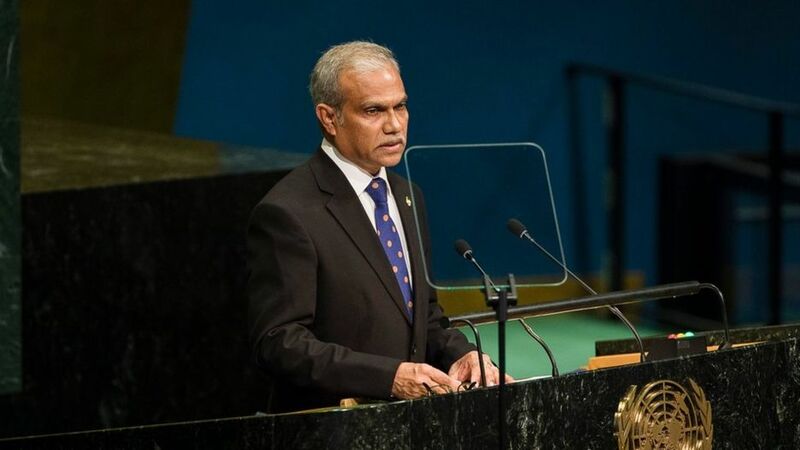 To bring together values such as democracy, human rights and the rule of law – asserting its commitment towards the development of such societies in its member states, all of which spells trouble for countries like the Maldives, that continually seems to be testing the boundaries of what would be acceptable or perhaps of late, not giving a damn about what is the accepted norm for a government that spouts democratic principles to be part of its establishment and setup. Unlike the UN, in theory, members of the Commonwealth have equal say, and this does not depend on their size or economic status. One of the benefits to member states being the fact that it gives smaller states just like the Maldives, a platform in the arena of international politics and diplomatic circles – in other words it lends a voice to punitive nations like ours and the room to engage with bigger nations that could prove to be helpful in outlining economic and other such policies that have a broader positive impact on the country and its people. While most would argue that a Heads of Government Meeting every two years is hardly something to boast about, the Commonwealth does come with benefits for member states in areas such as that of immigration. Especially during a time where Muslims are under constant scrutiny and threat of being denied entrance into certain parts of the world owing to the rise in threat of global terrorism, being a member of Commonwealth does afford citizens of a member country like that of Maldives, a cushion from the blowback if otherwise. As a Commonwealth citizen, if you are looking to immigrate to Commonwealth nations, you maybe entitled to visa-free entry if the country you are traveling from is deemed to be in “good standing” – a line I believe that the Maldives has already crossed. Bringing to mind the harrowing couple of weeks right after Maldives snubbed its neighbor India on the GMR deal where citizens had to line up near the Indian High Commission from dusk till morning in the hopes of getting their visa approved in order to seek medical treatment in India suffices as an example of how difficult things can get – if countries were inclined to do so. In terms of immigration, it the Commonwealth also does help member states when trying to gain entrance into non-member countries as well. Maldives is not a country with many embassies established on our shores. This means that, as a Commonwealth member, the British embassy or consulate can step into play the role as required for you to get the proper documents. Being a Commonwealth member also offers member states with access to participate in the Commonwealth Games, an international sporting event that countries like the Maldives would be hard-pressed to gain entrance to if not. This is tied to the dreams and aspirations of many a young athlete who works with sheer determination and focus towards making a name for themselves in an international setting such as what the Games offer. The Commonwealth also comes bearing for the studious amongst our young to seek fully funded study opportunities to developed nations which if otherwise, children from even middle class families of a country like ours can only ever dream of. Once again, the aspirations of the young who would lead our country tomorrow are tied to a valuable resource that is hard to come by these days, especially given the lack of scholarships forthcoming from the government itself, not to mention how scarce these chance are, even from other such international organizations and countries that are keen on providing students with such golden opportunities. Needless to say, though the benefits afforded might not seem to amount to much in the face of 150 million US$ dollars that the Kingdom of Saudi Arabia can grant to the Maldives, being a member of the Commonwealth does offer certain privileges to citizens of member states, the loss of which might not be so easy to deal with in the long run. Commonwealth is largely criticized for the passive role it plays when it comes to actively promoting the values embedded in its Charter. It was only in 1995 that the Commonwealth Ministerial Action Group (CMAG) was established with 8 ministers, its sole purpose being to deal with governments that are unyielding in their violation of the principles of the Commonwealth. CMAG also comes equipped with the power to take punitive collective measures such as imposing sanctions or suspending members who are seen to violate its Charter and principles. Even with the establishment of CMAG, Commonwealth is seen to be an entity that takes the easy way out more often than not. Commonwealth’s lack of actions consistent with its principles in the case of Sri Lanka’s human rights abuses under the reign of President Mahinda Rajapaksa is notable. Another example is of how Nigeria was partially suspended in 1995 for hanging a human rights activist Ken Saro-Wira, while the body largely ignored the abuse of the Ogoni people that had been the root of Saro-Wira’s campaign. The Commonwealth is also damned for its “insidious postcolonial politics” that prevents Britain and other affluent members such as Canada and Australia from providing a better leadership that could perhaps bridge the gap between the Commonwealth and other more focused and efficient entities such as the European Union. It was the CMAG’s involvement in the affairs of the Maldives following the coup which took place on February 7th of 2012, that ousted the first democratically elected President Mohamed Nasheed that saw emergence of rhetoric from members of the rogue government that Maldives should leave the Commonwealth. Some members of parliament were seen mocking the head of the Commonwealth herself in their attempt to sound important enough so that the powers they worship would be well impressed with how they were earning their entitled position. CMAG placed Maldives on its agenda following the coup from March 2012 to March 2013, until a Commonwealth backed inquiry into the power transfer found it to be a constitutional one. Going into the nitty-gritties involving how this particular event unfolded is beyond the scope of this article. With the establishment of the “truth”, the rhetoric to leave the Commonwealth also more or less died down along with it, not surprising given that the pressure on the Maldivian government eased off for the time being. It was in 2015, just last year, during the turbulent political trials that saw the arrest and imprisonment of top opposition political figures in the country and some influential members from the government’s cabinet itself that saw CMAG once again intervene into the affairs of the Maldives. Ex-Foreign Minister Dunya Maumoon then is reported to have said that the Maldives “will seriously consider its membership at the Commonwealth” if it were to be placed on the agenda of CMAG for a second time in 4 years. Furthermore, Dunya criticized CMAG for continually pushing the Maldives for reform when no “serious” violations existed in the country and also lamented the fact that the Secretary General Kamalesh Sharma was too trigger happy to take action without giving Maldives the time to follow due process. Dunya also bemoaned the fact that being placed on CMAG’s agenda posed reputational risks to the country, putting its economy and democratic governance at risk. So what made the government finally bite the bullet and make a decision that made Maldives appear in headlines of almost all major global newspapers? The reason being that the Maldives once again found its way into the CMAG’s agenda on the meeting that was held on 23rd of September of this year, where CMAG expressed “deep disappointment” in the worsening political situation of the country. This meant that the Maldives had to buckle down and show CMAG that they mean business when it comes to the reforms they have been promising to the group in a bid to buy time to do whatever it is that the government wanted to. This decision by the CMAG of course did not come without reason. CMAG listed out 5 concrete reasons as to why Maldives might face imminent suspension, some of which includes the flawed and politically motivated trials to imprison those that were deemed to be political rivals of the incumbent President, how the parliament of the country has been hijacked by Progressive Party of the Maldives (PPM) and is used as a tool to oppress the people – the recent ratification of the draconian Defamation Bill suffices as just one example, and furthermore, the government’s seeming reluctance and will to stem the spread of radical ideology which was also raised as a point of grave concern. Intervention attempts by various teams such as the UN Special Rapporteur on Independence of Judges and Lawyers which in 2013 recommended the Maldives to strengthen its judicial independence, which of course has gone unheeded, and attempts by the CMAG itself to try and work out a way to get all political parties together to discuss a way forward, the latest of which involved requirement for all party talks which was headed for trouble right from the onset. Thus, a regime that seems to be distancing itself further and further away from nations and entities that actually demands of the government to uphold principles of democracy and good governance upon which the country’s Constitution itself is based on, it should be of no surprise that the ultimate decision made by the executive is to leave the Commonwealth, thus plunging the citizens of the country into times of more uncertainty, questions about most of which could not be answered by representatives of the regime themselves. “The decision to leave the Commonwealth was difficult, but inevitable” does not suffice as an explanation for a judgement reached by the executive, that could plunge the lives of Maldivians into unforeseeable difficulties in the near future. If one were to ask why the need to isolate ourselves from those nations and entities that would attempt to interfere? They would have to look no further than the damning evidence reported on Stealing Paradise, Al Jazeera’s recent documentary into the massive corruption allegations involving the core political elite of the country, which ultimately points the finger towards the man himself. It is being talked about with much fervor today, the Islamic viewpoint behind criticizing the leadership and governance of a country and its head of state. Last year, right after the Independence Day celebrations were held, I wrote about how the government was imminently going to pass legislature that is “required” to put us behind bars for exercising our right to free speech, especially when it concerns the government and its elites. Today would most likely be the day upon which this prediction is going to become a reality, depending on whether government aligned party members pay heed to the sentiments of the people or bow down to their own greed, which has seen them profit most handsomely in recent times. With the Defamation Bill submitted to the Parliament for the second time around, it went into the committee stage where religious scholars from the Fiqh Academy in the country were invited to have their say. Unsurprisingly, the sheikhs who turned up were in fact in agreement that the Defamation Bill is crucial and an important bill that needs to be passed, and furthermore went onto cite that defamation in fact, is considered to be a criminal offense in Islam. These sheikhs further went onto elaborate how criticizing the leader of a country is not to be done, how Islam forbids this, how Islam asks of society to obey their leaders, even if they turn out to be tyrannical monsters. Up till now, I have tried to refrain from saying much on the issue, because for one thing, I might not be the best of people to talk about things from an Islamic perspective, given that my knowledge when it comes to the Sharia’ and laws via which Islamic jurisprudence is governed is pretty much limited in comparison to the high heeled scholars of the country, the ones who go through their entire lives with their third eye blind, unable to see or hear of the cries of the sheer injustice that has become the norm in this country of ours. My knowledge of Islam, the religion I follow and love, which is very much a part of who I am, does not jive at all with what the esteemed sheikhs revealed at the committee floor. In fact, I went on to do some reading to find out what I could about the scriptures being quoted often by the sheikhs who are in support of such a law being passed. I found out that Sunni scholars agree upon the point that a leader should be obeyed, regardless of how corrupt and tyrannical he or she becomes and tramples the law of the land as they see fit. The only avenue left, according to these groups of scholars, is to advise the despot in place, hoping that his non-existent conscience grows a limb or two before the whole country is engulfed in misery and suffering. On this note, Shiite scholars disagree and goes as far as to say that a ruler needs to be even forcibly removed from office, if it were to come to the point where he or she starts to trample on the rights of the people, when corruption becomes the accepted norm along with injustice that becomes rampant. According to these groups of scholars, corrupt and tyrannical rulers are not to be obeyed, and they hold the viewpoint that it becomes a “must” upon the people to remove such a leader from that position of power upon which they reside. Of course, given the Sunni-Shiite split that pretty much makes anything the other group has to say blasphemous over the other, this clearly does not give much insight when it comes to how exactly Islam views the concept of leaders, the sheer magnitude of the responsibility that is thrust upon them, and how society should react and be able to act when it comes to less than stellar behavior from the leaders that govern. Islam as a religion comes bearing peace amidst above everything else. This does not mean the peace of the kind that exists merely on the surface, but peace of the kind that reigns when there justice to be had in a society, regardless of race, skin colour, blood line or your status of wealth. Establishing justice in its truest form, the way Allah SWT decreed it might be an impossibility in the context of the world, with its inherently corrupt people, the shifting areas of grey within the established man-made laws and the differences of opinion that arises in defining what the laws mandate, which sometimes are as vastly different from the other as night is to day. In Surah An-Nisa, Allah SWT says, “O you who believe, be persistently standing firm in justice as witnesses for Allah, even if it be against yourselves or parents and relatives. Whether one is rich or poor, Allah is more worthy of both. Follow not your desires, lest you not be just. If you distort your testimony or refuse to give it, then Allah is aware of what you do.” [Ayah 135]. Furthermore, Anas (R.A) has narrated that Allah’s Apostle (PBUH) said, “Help your brother, whether he is an oppressor or he is an oppressed one. People asked, “O Allah’s Apostle! It is all right to help him if he is oppressed, but how should we help him if he is an oppressor?” The Prophet said, “By preventing him from oppressing others.” Volume 3, Book 43, Number 624: Sahih Bukhari. What does all of the above indicate? The simple fact that establishment of justice becomes paramount in a society, more so when we claim ours to be an Islamic one, standing firm in its principles. Thus, it becomes the duty upon the ruler appointed by the people to manage their affairs to establish the system of justice that remains removed from other influential forces at work. It becomes a must upon the ruler to appoint judges who are able and remain uninfluenced by corrupt practices, and to create check and balance mechanisms that works properly to weed out vile practices that breaches the establishment of trust that is forged between a people and their government. Hence, it becomes imperative upon the people to voice out against injustice, corruption, and mismanagement of the kind that hurts the people and society. What the Defamation Bill is geared to do is to stop any voice of reason out there that sheds light on any such practices of the government in the management of our affairs. It is targeted towards instilling fear in the hearts of those that do not want tyranny, injustice and corruption to be the way of life for Maldivians, but are helpless to do much more than voice out their discontent. With humongous fines cited as punishment, not to mention jail terms if people are unable to cough up the fines payable to the state in millions, the Defamation Bill closes the door on the rights of the citizen when it comes to “preventing the oppressor from oppressing others”. Looking into the history of how Islam as a religion was propagated through different times, up until the last of the Prophets, Prophet Muhammad PBUH was sent, there exists lessons for all of us in what took place then. If one were to ponder upon, for instance, why Prophet Musa (AS) was sent upon the people of Egypt, the Pharaoh being notorious in the tyranny that he was imposing upon his people, I believe we would identify what is wrong with the statements of the Sheikhs from the Fiqh Academy. Of course, Prophet Musa (AS) undoubtedly was sent to show the people the right way, but he was also sent to liberate the people who had been suffering for years under the tyrannical rule of a leader that was becoming more and oppressive and paranoid by the day. Paranoid enough that he wanted all male offspring born to the people be killed, for fear that the vision of a leader who would end his reign may come true. A lot of people talk about how Prophet Lut (AS) was sent upon the people of Sadoom and how it all relates back to acts of homosexuality that was rampant amongst their people, to the extent which men preferred their own gender over women. But what most fail to pinpoint is the fact that there existed more severe problems in their society than homosexuality. Injustice was the law of the day, where judges were corrupt, awarding justice to the highest bidder. The poor bore the brunt of the unequal practices of the state and no message that Prophet Lut (AS) delivered upon the people were heeded upon. The sheer injustice of the people of Sadoom, who had become a law unto themselves was a pivotal reason why they perished under the punishment of Allah SWT. But few of the esteemed Sheikhs remember to tell this part of the story when they regale the life of Prophet Lut (AS). Moving on, let us think of why Prophet Muhammad PBUH was sent to us, as a blessing upon mankind. Of course once again, he was sent as a guidance for the Ummah, until the Day of Judgement is upon us. He was sent as the last Prophet, not only for the Arab race, but for all mankind, across the globe. But while establishing the principles of Islam such as oneness of Allah SWT and that one should turn to Him and only Him, what else did the Prophet PBUH propagate and teach and establish during his life? He taught the Ummah the importance of establishing justice, the benefit of seeking knowledge, the peace that would never be found in a society unless the rights of the collective people are seen to and established. He taught us to listen to the voices of the people, to hear both sides of an argument and the importance in establishing the truthfulness behind testimonies taken into as evidence when delivering punishments and verdicts on civil and criminal cases that arose during his time. He showed the value behind respecting the other, regardless of the differences, even be it when it comes to their faith. He liberated the people that were suffering under the tyranny of the rich and elite in Mecca from a life of servitude or worse, and he showed us that democracy is not a “modern” or rather “un-Islamic” concept as most would like to point out, but democracy in its truest form comes from the practice all of the above. Why are societies so afraid of giving power back to the people where it rightfully belongs, so inherent in subjugating the people? Why do tyrannical leaders such as Bashar Al-Assad of Syria, late Saddam Hussain of Iraq, Hitler from Germany and even Pol Pot who led the infamous Khmer Rouge, find their footing in society and are able to repress people in a manner that is incomprehensible to the freethinker? Perhaps, the answer lies in a mix of factors which includes religion in its midst. Religion that is used as a political tool to suppress, a tool that is used to silence the voice of dissent, the discontent that people feel, to impress upon them the fear of the sovereign being upon which their faith resides, all the while forgetting that the Creator looks upon leaders of society just as much as its people. Leaders tend to forget that we all share the commonality that is death. Whether one believes in the Hereafter or not, we are all going to die someday. Humans, though we would like to assume that we are the most advanced of species to walk the Earth, have not yet figured out a way to prevent death, or perhaps the secret to an eternal life. Thus lies the stupidity in thinking that as leaders they are invincible. That just because they sit on that throne today, they will be there forever. We the people cast our votes to elect our leaders, be it our representatives at the Parliament or the head of state of the country. While the system has in place organizations specifically geared towards establishing the check and balance mechanism that should rightly work to remove the unhealthy practices of corruption and injustice, when that mechanism fails, there should be other avenues for the people to address the issue, be it even the last resort of removing an elected official from office. There should be legal avenues that protects the rights of the people to this extent, so that they are not left vulnerable in the hands of madmen who are willing to cross every single line out there to serve their needs. The lesson that leaders, especially those that claim to be Muslims need to learn is that even if people were to listen and obey them forever because they are left with little choice but to do so, there would indeed come a day when that power would be stripped from them, where they too would face the bitter taste of death. Where I believe that they would face a worse torment than what the people could have delivered if they had the inclination to, where they would be answerable to their Creator for all that they had done in this world. The recent deaths of two 14 year old boys just this Friday (03rd June 2016), has once again stirred the outrage of the public when it comes to the existence of gangs and associated violence, especially in the capital. Calls on the authorities to take action has been pouring in from all sides, while the Home Minister Umar Naseer tried politicizing the issue as he is prone to do so to in order to earn his paycheck. All the voices will die down eventually in a couple of days as it usually does, because for one, there is not much people can do apart from going onto the streets and playing out their own form of vigilante justice, secondly, the issue is far more complex than the very obvious resultant effect of violence and bloodshed, and thirdly, the law enforcement and the justice system has been in a loop of repeated failure for far too long for it to do an abrupt reversal and start being true to the principles of the establishments in question. While research into gangs and resultant behavior has been far and few when it comes to Maldives, The Asia Foundation published a report on “Rapid Situation Assessment of Gangs in Male’” in 2012 which highlighted the reasons behind the emergence of gang culture in the country. A National Values Survey (NVS) conducted by the Foundation in 2011 brought to light that there existed about 20 – 30 different gangs operating in Male’, with 50 – 400 members in each group. I can only imagine that the numbers must have increased by now. The research while primarily conducted in Male’, conducted 24 in-depth interviews with gang members and held focus group discussions with gang members as well. The picture that emerged then was a harrowing one at that, with gang members themselves expressing concern about escalating violence. The website mvmurders.com lists down homicides that have occurred in the country, an attempt to document the lives that has been lost to senseless violence. Though not all of the murders recorded resulted from gang violence, most of it in fact can be attributed to just that. With 57 murders recorded, 49% of them have taken place in Male’, while 12% in other islands within the Kaafu Atoll and 7% in Laamu as well as Haa Dhaalu. In terms of years, the highest percentage of murders (18%) were committed in the year of 2012 followed by 2015 in which 14% of the recorded murders from 2011 to-date have taken place. 2016 is following closely on the heels of 2015, with 6 murders already recorded, and we have barely made it halfway through the year. For a country with a population that was recorded to be just 344,023 according to the latest census carried out in 2014, 38% of whom live in Male’; the numbers paint an alarming picture, given the continued inadequacy of the institutions in place to take constructive action to address the issue. It is only natural that the incumbent home minister be blamed on a large scale for the insensible deaths that has taken place. While I agree that he is indeed responsible in a big way since he has been occupying that position for over 2 years now, the inevitable truth is that the culture and existence of gangs that we see so prominently now, emerged during President Maumoon Abdul Gayyoom’s regime. President Maumoon’s policies on centralizing development created the cesspool that is Male’ City, which in turn led to the unraveling of socioeconomic differences on a large scale. Thus spurred the establishment, growth and activism of gangs in the country, largely centered in the capital. This culture has been for the most part supported by the elites in the political structure, which is how gangs survive, become stronger and more embedded within the system. According to the report from The Asia Foundation, one of the core reasons driving youth to join and participate in gang-related activities stems from the widespread breakdown in family structures which made them seek out ways of belonging in order to replace the breakdown of their familial structure. Because they want to turn away from problems at home, they seek out the companionship of the less than savory, which in the end means these children become part of the structure that forms these gangs. Report also highlighted the weak democratization in certain areas which contributed to the problem. The political and business elite making use of gang members as a means to an end forms the cycle of exploitation and indebtedness that exacerbates the issue. This also means that for the youth, gang related activities also become their way of earning a paycheck – as difficult a pill as it might be to swallow this fact. Lastly, the report also highlighted on the harsh sentencing carried out for youth committing minor offenses, the resultant effect being increased disillusionment among young people about the system that governs. A little bit of walk down the memory lane helps form the picture that relates back to the findings of the report discussed above. It was in June of 2008 that “gangs declared peace” in Male’, by announcing a new “alliance” or “peace treaty” in a press conference renouncing violence against each other. According to the press conference, the group would work with the government on issues such as blood donation drives for thalassaemic patients. If I recall correctly, this was following an increase in violence on the part of gangs, which required the Maldives National Defense Force (MNDF) to come out into the streets to show to the public that they were indeed worthy of their monthly salaries. I also vividly recall one of the officers giving an interview to the press on how they had worked together with the gangs to hammer out this deal. In time, people also forgot. Since then, gang related murders has become a sort of norm in the country. Periods of violence and lulls that people have more or less gotten desensitized to. The murder of Bobby in 2012 remains forever prominent because he was an innocent killed along the way, a case of mistaken identity. Stories of how the senior judges of the Criminal Court have special procedures in place when it comes to gang related cases is also something we have heard over time. Police officers who are committed to doing their jobs, compiling evidence and presenting them in court to convict members of gangs on the offenses committed does not seem to make much headway when it comes to an issue that is riddled with corruption and vested interests of politicians. One has only got to bring to mind an incidence that took place during Abdulla Riyaz’s reign as Police Commissioner, who faced the issue of a police officer that refused to testify against a member of the notorious Masodi gang for doing him harm. I remember Riyaz being livid over it; he might have been one of the executors of the coup in 2012, but from what I saw, he was someone who was big on establishing the police culture within which most law enforcement agencies in other countries thrive. But once again, the politics involved, the fear of being faced with a worse fate meant that even the police officer backed down on giving his testimony to court that would have convicted the gang member. Moving on, we come to the current home minister’s reign. The man, as pompous as he might be, had a vision of grandeur in tackling drugs and gang related crimes in the city. Investment in the dog squad was one such move. Enforcement of MoniCon (monitoring and control) orders was another. It was Umar Naseer’s move on former Vice President Ahmed Adeeb, a man who has been pictured many a time with various gangs along with his beloved President and wife, that clipped the wings of the golden unicorn that Umar rides on. His powers as the Home Minister were basically cut down to the point where he could still sound like pomposity itself while twiddling his thumbs at work. This was largely attributed to Umar’s orders to low ranking officers within the police service to investigate then Tourism Minister Adeeb for alleged unlawful activity. In 2014 Maldives Police Service (MPS) launched an operation to dismantle huts used exclusively by gangs in the capital. The operation however, was a short lived one. What began in August of 2014 was quickly brought to a halt in September when President Abdulla Yameen decided cease the dismantling operation. As he stated it, the operation was being brought to a stop “until a solution could be found after studying the whole problem”. The President also stated that, though the operation had been undertaken with “good intentions”, dismantling the huts alone would not provide a long-term solution. So here is where one needs to ask, where does the long-term solution that the President was hinting at lie? And how soon, if ever, would we see it? Recalling the speech that was delivered by the President after jailing ex-VP Adeeb on various charges, which includes the alleged assassination attempt on the President, is also evidence enough of the lack of political will behind the rhetoric echoed by the government on gang violence. On a televised speech, President Yameen confessed that gangs were given money by Adeeb, and that an alternative arrangement needs to be sought when it comes to maintaining that particular line of “friendship” after Adeeb had fallen out of favour. These I believe were statements delivered by the head of state, live on national television. One has to look no further to realize that gang related violence and other such activities are here to stay, as long as politicians who are in power continue to bankroll, make use of and back them. One interesting development along the way, before the recent murders took place, was the incidence where Special Operations (SO) officers of MPS ransacked three gang hangouts, with no protocol or official mandate backing this “operation”. Equipment used by gang members were smashed to smithereens, blood was shed, though luckily none of it resulted in loss of lives; the story that emerged was that one of their officers had been threatened by a gang member or something of the sort. I believe threats of the sort must be hurled every now and then and that SO officers are more than able and thick skinned enough to handle a few slurs and insults. This makes me believe that something more happened, something which their superior officers didn’t want to deal with officially, resulting in the officers taking matters into their own hands. While I don’t condone the act itself, I believe that this hints the level to which the issue of gang related violence and other such crimes has fallen – there is no justice to be had, so might as well take matters into own hands to ensure that the gangs receive the message loud and clear. Do not mess around with SO officers. Not much news emerged in an official capacity on what took place afterwards. There was talk of SO officers being shuffled here and there, but we all know that putting up with SO is a ‘necessary evil’ by the government of the day, as long as they want a squad of people who would not hesitate to follow orders and beat citizens up. That is the most apt and fitting description of the squad I can come up with. The news this morning that some 19 individuals apprehended right after the spate of violence took place have all been released is another such example. According to government aligned newspaper Avas, a love triangle seems to have been the reason over which the violence began in the first place. The chilling, matter of fact account from the anonymous gang related source cited on the paper says as much. Interestingly enough, the police were quick to deny that the arrests made had been in anyway related to the murders that were committed within a span of just a couple of hours. The “lack of evidence” cited is just one of the many proverbial slaps on the face of the public, something which I believe will continue to happen long into the future. At the time of writing this article, a police news conference brought forth the news that two individuals had been arrested over the murders. While it is more than difficult to view the road ahead with any positivity, a “solution” such as the one proposed by the home minister is one doomed to fail. Umar Naseer told in an interview given to Avas that there are plans to send off minors involved in gangs to a police training facility, I believe with the hopes of disciplining these children. An issue that is multi-dimensional in nature requires multi-pronged solutions in order for positive changes to emerge. First and foremost, if any change is to take place, there has to be political will behind it. No social issue can properly be addressed without the backing of the government in place. Solutions requires funds, commitment and policies that can identify and address the various issues that can emerge and change over time. Which is why, with President Yameen at the government’s helm, it is near impossible to see the incumbent regime doing anything constructive regarding the existence and operation of gangs within the country. The law enforcement establishments needs overhauling in their entirety. There will never exist room for justice nor peace for the people of the country, as long as the police and the court system continues to trample on the rights of the people enshrined in the Constitution and the laws of the Republic. Changes need to happen from within, from the attitudes of the officers in place to rooting out corrupting influences and practices. Though easier said than done, I believe that reforming these key institutions is a necessity that needs to happen for any positive change take root on the ground. Developmental policies of the government needs to undergo radical changes if we are to stem the social issues owing to the centralization based developmental agenda that is currently in place. Everyone talks about how Male’ City is overcrowded, how social issues are rampant, how families break apart having to make do in congested one room “apartments”, the rising costs of living, the inequality divide that is prominent. All of this relates back to the fact that majority of the population has to shift to the capital in order to seek for better services in terms of education, basic healthcare and beyond. President Mohamed Nasheed’s decentralization policies were a starting point towards giving authority with accountability to provincial zones within the country – a dream long forgotten now. However, I still believe that decentralization is the key towards alleviating the burden of citizens who flocks to the capital – and along with it, the social issues which in the end leads to establishment and existence of gang related activities within the country. Education is the most powerful tool in empowering people. Which is why the educated always accuse the incumbent regime of despoiling contemporary education policies that could make a difference. Subjects on morality and ethics, education in terms of best practices in Islam are all lacking in our education syllabuses. Furthermore, identifying those kids who are having trouble in dealing with the school environment, the root cause behind kids who are acting out – all this requires teachers to go beyond their mandate and care about the welfare of their students beyond the borders of the classroom and school. This in turn requires that teachers be equipped with the skills to do so, that counselors employed in schools work with students to make a difference. It is a tough and ofttimes a heartbreaking journey for teachers who give their all to the “difficult” students, but I believe that this indeed would make a difference. Employment opportunities for the youth are crucial, if we are to keep them gainfully employed without having to resort to activities that are at most illegal in nature. Maldivian youth shy away from menial labor that can be classified under the 3D sectors (dirty, difficult and dangerous jobs such as construction). This is the reason why the government needs to identify areas in which youth would be willing to work in, to step up their efforts in vocational training, and ensure that entrepreneurship thrives and is given a fair chance in the economy. All this requires collaborative effort in terms of agencies specialized in youth, education as well as other sectors that could help pave the way forward. Family counseling services, as highlighted in the Asia Foundation report is also crucial. The stigma associated with seeking counseling, the policy issues related to giving graduates in the field the room to work and grow is essential. Otherwise, family issues that grows out of hand would continue to fester, leaving behind wounds that might never get the chance to properly heal, if ever. All this relates back to young children turning to the next best thing – gang culture within which they find that sense of belonging that should be nurtured within families. The solutions outlined are just certain areas that I can think of, which requires proper in-depth study, finances and of course commitment and the backing of the political elites if they are to make a difference. I just hope that the people realize that without any of this changing, our country would become intolerable for the generations of tomorrow, the young ones that we are nurturing to lead this country of ours into the future.